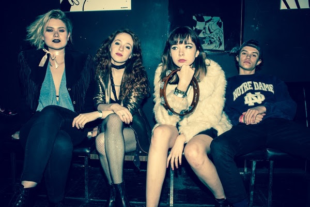 Although The Regrettes, based in LA, formed a little less than a year ago, Lydia Night (lead singer); Genessa Gariano (guitar); Sage Nicole (bass); Maxx Morando (drums) sound as if they have been through the trenches together for years. Another surprise: all four musicians are under the age of twenty. This fact makes the candid lyrics especially stunning. “Seashore” starts out as a simple song about a girl who doesn’t appreciate how she’s being treated (“You’re talking to me like a child, I got news I’m not a little girl”) and in true punk fashion, builds to the real message: “I’m like nobody else, so you can just go F*** yourself”. With the plucking guitar and castanets in the background, it sounds like a girl group from the 60’s, but the lyrics pack a 2016 punch. Lydia Night has been the primary songwriter on this album and no song reflects more what a fifteen year old is going though than “A Living Human Girl”. After a list of perceived faults (“I’ve got pimples on my face, and grease in my hair, and prickly legs go ahead and stare”), Night proceeds to tell the world that she is a real person (“Sometimes I’m moody and sometimes I’m not; Sometimes I’m lazy and sometimes I’m not”) and that is just fine. The songs all have clean, brash tunes that invite exuberant dancing and the lyrics begged to be sung. At the top of your lungs. Feel Your Feelings Fool! is out January 13th via Warner Music.